When Did You Stop Hugging? We are born into a world of hugs and cuddles. Even as toddlers and young children, physical contact is welcomed and expected. In spite of those conditions, many people reach adulthood with reactions to hugs ranging from either slightly uncomfortable with human touch to outright avoidance of any sort of contact. If you fall into that “discomfort” range, can you remember when you stopped hugging? I am aware of three main reasons people change their acceptance of this powerful and nurturing activity. Trauma – Something occurred in your life where the security of touch was disrespected and you were harmed physically or emotionally because of that. Unfortunately, this is far to prevalent. This is a long, slow challenge to ever feeling comfortable with human contact once that trust is betrayed. Another person’s opinion – Usually a parent, teacher or best friend indicates that hugging is not appropriate. I hugged and hung onto my best friend, Marx, wherever we went until I was about 14. That’s when my mother called me aside and told me guys our age didn’t do that. We shook hands. I didn’t argue with my mother, I just became very aware of any physical contact, not only with Marx, but with all males from that point forward. Group opinion – Your peer group doesn’t identify hugging as an appropriate means of communicating. I went to college and was torn in two directions. I was a member of a fraternity where hugging was not the macho thing to do. I was also a member of the theatre department where everyone, students, instructors, department heads, all hugged. Thank goodness I spent most of my time with the theatre group. Regardless of when and why you stopped hugging, if you have, the more important question is when do you rediscover it? There are ample opportunities today. Of course, Cuddlist is an excellent way to be reintroduced to cuddling in a non-sexual, non-threatening, respectful way. There are “Free Hug” initiatives cropping up everywhere. And, of course, identifying friends and family who also want to rediscover hugging as a viable and much needed greeting and enjoy the rebirth of this amazing practice together. And for those of you who have already rediscovered the joy of hugging or who have never lost it, come find me. I have unlimited hugs to share. 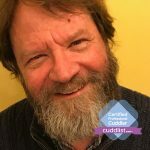 Errol McLendon is a Professional Cuddlist based out of Berwyn, IL, just outside Chicago. Errol is a Reiki Master, Certified Tarot Grand Master, and a Certified Professional Coach. Errol feels “the power of touch and human contact is transformational”. You can book a session with Errol here.